A friend gave me a car after it broke. He didn't want to deal with it, so he bought a newer one. Well it's my first car, and it would be great if I could drive it. My best skills are robotic, electronics, and programming. I'm a fairly beginner mechanic, but I'm not afraid to get my hands dirty. I was told it is an 83 but the manufacturing date is January 84. Its a Volkswagen Jetta and it has around 225K miles on it. I'm pretty sure it has fuel injection, but I'm not sure which motor it has. If you need to know I can find out. I am obviously trying to get it to work. The main problem seems to be no spark. The coil was tested by connecting and disconnecting to 12V and produced a spark, when the output wire was held very near a ground. However, the distributor doesn't seems to be properly signaling to spark as when trying to start there is no spark directly from the coil. The distributor was removed before he gave it to me and I know it's at least partially broken, and it is going to need retimed or something. I have access to oscilloscopes, but I don't know how to test it. Another seemingly relevant fact is when the engine is cranked and then released, it continues cranking for a bit. This started happening when it broke so it is probable related. The car was driving down the road normally and completely out of the random the engine cut out and yea. It seems most likely that the issue is either the distributor or the icm. I know when I try to explain things they tend to get jumbled and thus become hard to understand, but I hope that makes sense. What I was hoping for is to get some suggestions in what to do to it next. So, what should I try next in troubleshooting and fixing this vehicle? If I missed a detail that would come in handy to figure out what is wrong, let me know and I will do my best to answer. Thank you for your time, I could never fix cars without you guys! I won't be able to follow this up with you but at a minimum find out what the heck it is. Uncertain of model year, engine size of perhaps four possible, whether it's fuel injected or not and a distributor pulled out and who knows why for now. Distributor type will matter whether it's an automatic or standard. It cranks when key released or you seem to think so. Spark testing and how you determined no spark questionable. For the moment at least see if rotor turns in distributor with cranking. The initial problem and still now could be ignition switch itself. 30 year old or so with some miles up there despite low per year is still up there IMO. Should be a 1.7L. I agree with Tom that you should make sure the rotor rotates when you crank the engine. If it doesn't, you won't have any spark. Another thing is that when you test a coil using that type of test, it might not produce enough spark because your cut off time isn't fast enough. Your cut off time has to be under 30 microseconds. You need to do a bypass test at the igniter and the spark has to at least be able to jump a 3/4 inch gap. If you have a scope and know how to use it, you have an ace in the hole. I'm almost certain it is fuel injected. The distributor has been removed and is going to need re-timed or whatever you call it when it is put back in. I'm fairly sure the rotor would rotate if the distributor was in the engine. I got another ICU, it isn't identical but it has the same plug. It also isn't know good, it could be bad. It has the same voltage on the distributor wires as the original one. If the ICU is bad, I saw a really good deal on one that I would like to order ASAP if a new one is needed. I tested the distributor by connecting 12V and ground to the respective pins, and monitoring voltage on the signal wire. As i turned the distributor I got a signal ranging from 0V to 1.5V. I THINK it is ok. I have also manually grounded the signal wire for the distributor when the distributor was off, and the voltage on the coil stayed at battery. A wiring diagram for the ignitinon would be very helpful in diagnosing it. Would any of you happen to have an ignition wiring diagram for an 84 volkswagen jetta 1.8L? I will let you know any more info next time I work on it (tomorrow evening). If you have any comments/suggestions before then I would love to know. Also, do you think the ICU is bad? The Euro track schematics are pain to read. Especially when they use alphanumeric codes to name components. Usually the top is power and the bottom is ground. The numbers and letters at the left hand corner are indicators for how the circuit is powered. The track is huge and to provide every single path would be like 40 attachments. What makes the track difficult to read unless you have practice is that every symbol, number, and letter refers to something. Almost like a legend on a map. Does your hall sensor have power, ground, and produces a signal when you rotate the distributor. I honestly don't know which wire is what for the hall, but checking each wire should tell you what they are. Green is the ground side of the ignition coil. The ICM's transistor will ground that wire to charge the coil and remove the ground to cause the coil to fire. Brown/white, Green/white, Red/black are going to be power, ground, and signal for the hall effect sensor that the ICM uses for position input. Brown is going to be ground and should have less than 0.3V with the ignition turned on. Red/black at the coil ground side splice is going to the engine controller and fuel pump controller to be used for the engine speed signal or tach. All these checks need to be made by back probing the connector with the circuits loaded. 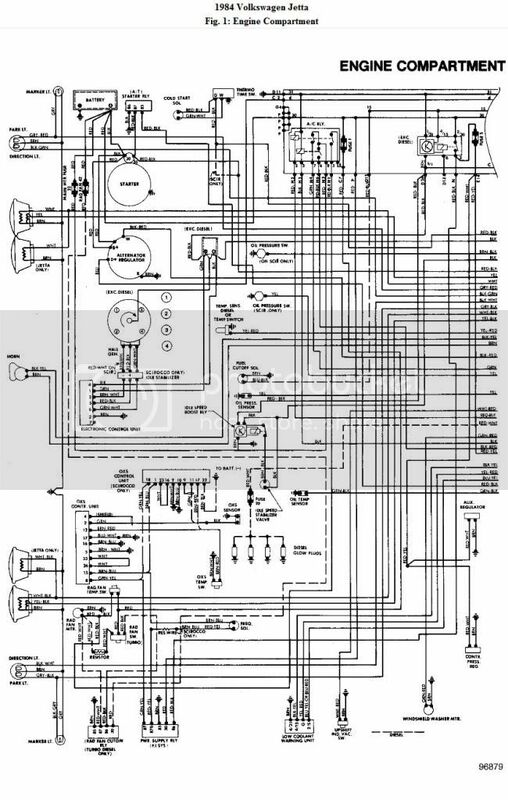 Reminds me of the old Chrysler wiring schematics...LOL. Those are a big PITA. Most of the old ones look like that. My Vette has everything on one diagram. I have Mitchell Vintage and they all look like that. I love Mitchell diagrams...especially when you can highlight each circuit. If AllData had Mitchell's style of wiring diagrams, they would be #1. If you like reading stories, read everything. If you want to get to business, skip to the second last paragraph. Well, had a fairly interesting evening. Now, the distributor had been suspected so it had been removed, I opened it and then I couldn't figure out how to put it back together. So, I managed to get it back together without the vacuum advance thingy, and it probably wasn't right anyways. When I put it on, it idled smoothly, and I then adjusted it to the point where it got the most RPM at idle. I know I don't have a timing curve, but it seemed logical that without the vacuum advance that that timing position would be the best. And also when I say a smooth idle, it was missing quite a bit, but the rpm was pretty stable. Ok so once I got it running good I drove it home. I only killed it twice in a row (I'm fairly new to manuals and I think the engine decided to misfire at the perfect time) but made it home fairly easy. The distance home was a few blocks so not very far. Myself and my dad decided to get some oils for our vehicles (me for mine, him for our family's 08 suburban) at walmart, (belive it or not walmart is a lot better priced than autozone) which is across our small city. Driving down there wasn't too bad, It drove fairly smooth. I insisted on synthetic and got penzoil platinum or something at $26 for 5 quarts, and he got part synthetic high mileage at like $16 for 5 quarts. Kind of ironic that the 08 suburban got the high mileage vs the 84 jetta got the high-performance synthetic, but I couldn't talk him into synthetic. And the problems started on the way home. Started fine, got to the turn lane to get on the main road home, and it kind of jerked and died when starting to get moving. After trying to start it a few times, it acted a bit like it was out of fuel, as it would kind of start but wouldn't idle (the fuel gauge was broken so we had no idea how much fuel it actually had, its on my to-fix list which happens to be a VERY long list) After pushing the vehicle to a gas station a few block and putting 5 gallons into it, we decided that the problem wasn't fuel. When trying to start it, it sounded like it rotated about 1 turn and then the engine stopped when still trying to crank on the same cylinder. After several tries, we got it to start, but if it got under about 2000 rpm, there was a good chance the engine was going to die and that it would be difficult to get it to start again. You might call it an extremely rough idle. Anyways, my dad drove home, allowing the engine to die numerous times, and when it was trying to accelerate the whole car shook and you could feel when the engine when it decided to fire correctly, as most of the time, it seemed, it wasn't. OK, so what is likely to have caused this? I know the lack of a timing curve probably didn't help, but why did it make it down there fairly smooth and jerk like crazy on the way back? I'm going to see if I can rebuild the distributor tomorrow, but do you think that is the only problem? What else do you think could cause this? Engine wasn't running well because the timings were off. Timings got off because since the vacuum advance thing wasn't in, the timing sensor was free to rotate by itself. Anyways, got the vacuum advance back on, and it's running fairly well. Thanks a ton for the advice, and those diagrams are amazing! If I have any more questions or problems, and I probably will, I will start a new thread. Your welcome! Glad to read that you got it figured out. Thanks for the follow up. Thread is locked as solved. Can be reopened upon request by the OP.